Rachel Paterson (Western Australia & St Edmund Hall 2012) is studying for a DPhil in Infection, Immunology and Translational Medicine at the University of Oxford, funded by the Wellcome Trust. Her current research is at the Sir William Dunn School of Pathology, and focuses on signaling and function in immune cells. She holds a BSc in Advanced Science majoring in Genetics and Biochemistry from the University of Western Australia. Rhodes Project: What do you miss most about your home town? 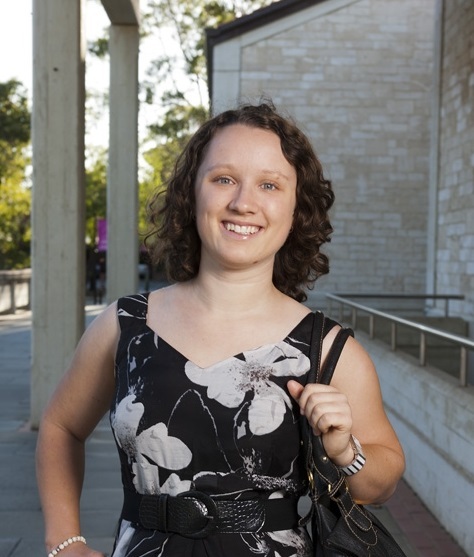 Rachel Paterson: I grew up in a town called Busselton in the South West of Australia – about 3 hours south of Perth. I probably miss the beaches most, and being able to go out on a nice hot summer’s day and have a dip in the sea. Though we had a really nice summer in England this year, so I feel like I’m being lulled into a false sense of security. Rhodes Project: What was your first paid job? Rachel Paterson: Working at the local nursery selling plants. It was really fun. It was a family-run store just down the road and I would go every Saturday to work down there. Rhodes Project: What was the most surprising thing about Oxford when you arrived? Rachel Paterson: It actually rains for days and days on end without stopping. I got warned about the weather, but I didn’t know it would actually rain non-stop for two weeks! Everything else was fine – I found it a really welcoming place and quite easy to slip into college life. I went to a college at my undergraduate university so there weren’t really any surprises there. Rhodes Project: What is it like studying medicine in the UK? Rachel Paterson: I’ve come from a science background - in biochemistry and genetics - and the course I’m doing here is more medicine focused. The translational aspect is much more focused on clinical trials than what I experienced in my undergraduate, so that was a bit different for me, but I find it really interesting. Another difference is that I’m working with people from all different backgrounds – medics, scientists, statisticians, mathematicians – it’s quite interdisciplinary. Rhodes Project: How did you first get interested in immunology? Rachel Paterson: I enjoyed science all the way through school, and I decided pretty early on that I wanted to do whatever I could to make the world a better place. I think education and health are closely related, so if you can help children to be healthy, then you increase their chances of being able to attend school and get a good education, which then increases their chances of having healthy kids that can get a good education. So I feel like if I can contribute through medicine I can help in a lot of other ways as well. Rhodes Project: What is the biggest misconception that people have about immunology? Rachel Paterson: One of the obvious ones is the myth that vaccines are overly dangerous, which is very worrying. The science indicates that the risks associated with the diseases that vaccines protect us against massively outweigh any associated with vaccines. It’s a difficult situation because the science behind vaccination is not always well understood and some people don’t realize that it’s so important not only for their kids but for whole communities. It may not be obvious but they are not just making a choice for their family, they could be affecting other people as well. It’s quite a sensitive area. Rhodes Project: If you had unlimited resources to devote to one issue, global or local, what would it be? Rachel Paterson: If I could give money to one cause it would be to eradicate polio. That is something that we’ve been working so hard on and putting so much money, resources and effort into for twenty or thirty years, and we’re so close to solving it that we really just need to finish the job. This is a disease that if we don’t totally eradicate it, will just come back again with a vengeance. And we can’t really afford for that to happen. If we cure this disease, then we can not only stop people from getting the disease and have massive economic benefits, but we can also give the world hope about our ability to eradicate other diseases like malaria and hopefully HIV and tuberculosis as well. Rhodes Project: How important is mentorship to you? Rachel Paterson: I think mentorship is very important, and I’ve been very fortunate to have had a lot of people throughout my schooling – high school as well as my undergraduate degree - who have helped me to get onto the right path and given me advice in different areas. It doesn’t always have to be academically related; in a lot of ways it’s important to have mentors in different aspects of your life. So I would say I’m not always seeking to find mentors but I think you do notice or realize when you meet someone who can really offer you insight through their own experience. Rhodes Project: Can you think of any mentors who have significantly affected you? Rachel Paterson: I’ve had a lot of fantastic women mentors – one standout for me is Suzanne Cory. She’s the first-elected female president of the Australian Academy of Science, and I’ve been inspired by her work and in particular her support of education. I contacted her when I was applying for Oxford because she did a PhD at Cambridge in a similar area, and I thought she might be able to give me some advice. Even though she’s the president of one of the biggest organizations in Australian science, she replied straight away and answered all my questions with a lot of detail and a lot of personal input. That really inspired and motivated me and now I’m here; it’s pretty amazing that somebody can help you like that so I’m very grateful to have mentors like her. Rhodes Project: What is your favorite thing to do outside of work or studies? Rachel Paterson: I really love playing sport. I know I’m in Oxford so I should be doing rowing and things like that, but I’m a massive fan of Australian football. I’ve been playing for about the last ten years. There’s a men’s team here but not yet a women’s team, so I’ve been working with the guys to try to get some more girls to try it out.